iMovie now allows you to turn the HD video on your iPad and iPhone into trailers, even as you’re recording. The new Theater view lets you preview and choose from nine templates in a range of genres including Fairy Tale, Superhero and Romance. Trailers feature customizable graphics with soundtracks written by legendary composers such as Academy Award-winner Hans Zimmer and performed by world class musicians like the London Symphony Orchestra. You can also share your movie trailers to YouTube, Vimeo and Facebook, and use AirPlay to stream them to Apple TV in high definition resolutions up to 1080p. iPhoto has been reimagined for iOS to take full advantage of the Retina display and intuitive Multi-Touch gestures on iPad and iPhone. Simple gestures can be used to select and compare photos side by side and flag your best shots. iPhoto gives you full control over color, exposure and contrast, and you simply touch the parts of the image you want to change. You can enhance pictures by adding beautiful Apple-designed effects with just a tap, or apply adjustments exactly where you want them with fingertip brushes. In addition to posting photos to Facebook, Flickr and Twitter, you can beam photos between your iPhone and iPad; stream photos and slideshows to your Apple TV with AirPlay; and use iCloud to publish photo journals to the web and share your stories with friends and family in a whole new way. Apple also released an update to GarageBand that adds social media sharing. iPhoto, iMovie 1.3 and GarageBand 1.2 are available today for $4.99 (US) each from the App Store. 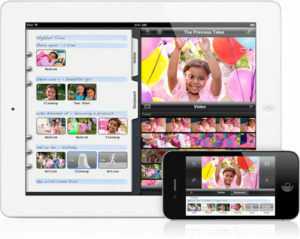 iPhoto is a universal app that runs on iPad 2 or later and iPhone 4 or later. iMovie is a universal app that runs on iPad 2 or later, iPhone 4 or later and iPod touch (4th generation). I have an iphone 3gs that is running on firmware 4.3.5 and i have jailbroken it using redsnow and then i went and downloaded ultrasn0w and everything but all it does is search for service. any ideas on how to fix this?